I invited Aubrey Perkins, a millennial astrologer, to be our guest columnist and write the Forecast for this Full Moon. I hope you enjoy her dynamic view on the morning's full moon and her playful writing style as much as I did. Thanks, Aubrey. 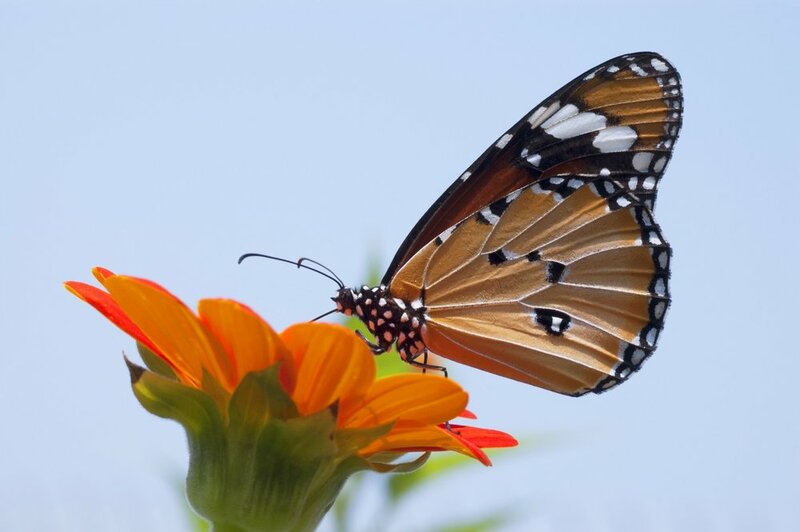 As Gemini season moves through, you may find yourself quite literally distracted by butterflies - reflecting on chaos theory and the butterfly effect. You’re pondering what the cause and effect of a butterfly flapping its wings may be and if it could have a profound effect on the future. You gather your friends and theorize. You google search to see what scientists have written on the subject. You subsequently fall into a wikipedia wormhole detailing the attributes of macrolepiodptera, “a group of insects within the order of lepidotera.” Before you know it, you’ve been staring at the blue screen of your computer for hours, it’s 2 in the morning, and you’re full of information about butterfly species, their mating habits, their food sources, but you still don’t have a clear picture on your original question. The Twins are an energetic duo, bouncing around, collecting tons of information in any direction their hearts pull them. As the moon moves into opposition on May 29th (7:19 am PDT) in steady-handed Sagittarius, we learn that The Centaur’s arrow is direction - and that direction is forward. The energy of any full moon is that of an emotional peak that pulling us in two directions. Gemini is an airy, social sign of sensing, gathering and formulating as many ideas and opinions as possible. Sagittarius seeks to burn away the fluff and assert which ideas make the cut to true genius and personal wisdom in leading us towards our greatest vision. This full moon asks you to use your intuition to whittle away to the core of whatever ideas you’ve been creating around and focus on what keeps you on the bold, daring and adventurous path of living your truth. Gemini and Sagittarius are opposing signs that are the most like each other, so despite the tension of the opposition, this should be a giddy, high energy time full of interesting conversations, learning new things and hopefully setting a course of some kind. Action is called for with these two and they both point to another accent-on-action planet. Passionate, fiery Mars’ move into mad-genius Aquarius amplifies the energy and idea-oriented nature of the Gemini sun and supports the moon's Sagittarian forward thinking mission. Aquarius and Gemini both deal with the nervous system, so you may want to forgo your morning coffee, as this Mars/Sun pairing sets up an inner buzzing! The ruler of Sagittarius, Jupiter is in Scorpion and happily hooked up with Neptune in Pisces and Venus in Cancer. Much of the magic of the moment comes from a gut-level feeling as you find the flow and marry the head to the heart. Gemini, if caught in the full moon's opposition, let your partner lead the way. Ride the joy of Jupiter rushing along in a water trine - like whitewater rafting. New visions come on fast! Mercury arrives in Gemini. Think about the symbolic meaning behind words. And let your light shine! Cancer, o sweet Mama, isn't it fun having Venus in your sign? The action is behind the scenes for you and frankly out of your hands. Who cares? Flow with it. Your body feels lifted up. Don't over do it but tap into adventure. Let intuition find wisdom in the info. Words are symbols, listen carefully. Leo, party with your tribe, dance with your clan, make merry and lighten up. Your home could be Grand Central for your peeps. This is mucho energy and you are naturally that way. Most will play with you but some won't. Let go of what and who's holding you back. Take a little down time, too. Virgo, hope your weekend was fun. Back at work you'll be firing on all engines. Prepare for an influx of information and communication. Meanwhile, your heart and soul wants the home party to continue. Communicate with every time you talk. Libra, you hear wisdom everywhere you go and philosophical talk sounds a bit like yada-yada to you. Basically, your Venus is tied into a beautiful, heartfelt conversation with all the water signs. Open your heart and let the logic go. It won't last forever but the ties that bind will be stronger. Scorpio, it's amazing, you can be this open with your feelings and everyone opens up to you. Somehow, your self-esteem expands and your often serious self feels – buoyant! That being said, there's no permission for a temper tantrum at home. Whatever that's about, look at it scientifically. Sagittarius, looks like you are the life of the party and that life comes bouncing back to you pretty fast. Don't get overblown with yourself, emotional energy is on a binge here too and that isn't your forte. Try feeling into what you preach and see if it matches your heart. Yep, walk your talk time. Capricorn, even with ambitious skills and opening doors, there are things you are out of control of. However, your friends, neighbors and cohorts, even your significant other may know the way. Let them take the lead for a while and trust the universe to let you rest in it. Aquarius, it's like you are taking a special supplement for brain power...as if you needed it. Your scientific approach might not win you as many points as a warmer, less detached approach to those of us out here. On the other hand, follow your passion, and use your contacts. Include them in some fun. Pisces, the water party could sweep you away into alternate realities in a tsunami of emotions. Use it to express YOURself and further your creative projects. The gregarious and optimistic moon in your work arena could be opening doors if you have a focus. Entertain friends at home. Aries, so how's it feel to have your fingers out of the electrical outlet as Uranus moves to Taurus. Mars in Aquarius helps you step down energy incrementally. An energetic moon - go expand your horizons. Act on passion with detachment even as emotional energy shows you the flow. Taurus, feeling edgy? Over amped? Welcome to the rest of your year. Getting clear on your values and those you share with others/society will be your rudder as you ride the new winds. The water energy works for you, so find/feel your flow. Plan on the go but get moving.